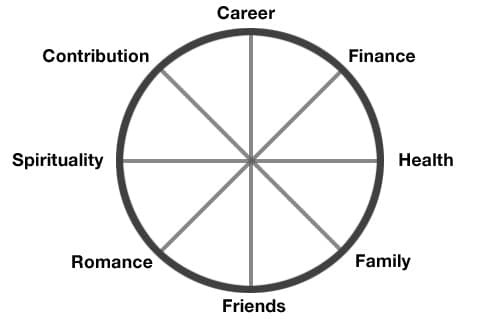 Today I’d like to talk about the life wheel, also known as the wheel of life. It’s one of the coaching tools I use in my coaching and will be an essential tool in your growth journey. What is the Life Wheel? There are many different versions of the life wheel out there. The common areas are career/studies, family, love, friends, finance and health. The remaining few are more subjective. They can be personal growth, recreation, spiritual, or others. Each segment comes with a rating scale of 0-10, representing how you’re doing right now – 0 being the lowest, 10 being highest. After you rate each segment, you mark out your scores, then connect the dots. In the end you get a web-like diagram that gives you an instant visual look at how you’re doing. The most useful part of the wheel is the visual representation, which gives you a helicopter view of how you’re doing – whether you’re doing very well, okay/normal, or poorly. After all, it’s hard to know how you are doing in your overall life when you’re so focused on your day-to-day activities. You may subconsciously know you’re putting an area on hold, but this neglect may not be apparent. Subsequently, there is no real call to action. The life wheel lets you spot gaps instantly, so you can intervene and work on the low scoring areas before it’s too late. Career – The name of this segment depends on what’s applicable for you now. Use ‘Business’ for entrepreneurs, ‘Career’ for employees, and ‘Studies’ for students. Finance – How you are doing financially. Whether you have the money and resources to pursue your goals. Health – Your state of health as well as your lifestyle. Diet, sleep, exercise falls here. Social – How you’re faring in your social circle. Family – Your parents, siblings, next of kin, relatives, or even your guardians. Love – The amount of love you feel in your life. While it can represent the status of your relationship with your spouse / boyfriend / girlfriend, it doesn’t have to be the case. Love here does not refer to romantic love – but about universal love. Recreation – Your recreation and enjoyment in life. Contribution – How you’re giving back to the society. Social cause. Humanitarian activities. Spiritual – Your connection with the universe. Some call it higher power / God / higher self. Self-image – How you see yourself. I believe that no matter who you are, these 10 areas are essential to living your best life. They are representations of the 4 core aspects of every human being: Mind, Body, Heart and Soul. Some people may feel that only certain areas of the wheel apply to them. For example, maybe they think that spirituality is unimportant as they’re free thinkers. This is a misconception as spirituality refers to your connection with the universe — it has nothing to do with having a religion or not. So they ignore the spiritual aspect of their lives and build on tangible areas like career and health. However, spirituality relates to our soul and it’s an essential part of living a full life. So for those who neglect their spirituality, there comes a point when they feel empty about life. What’s the meaning of life? Why am I here for? This is when they start to look for a deeper meaning behind their existence. Some people disregard money, saying that money is not important. That’s a misconception though. Money is merely a symbol for value in today’s world. While not a perfect measure of the value one gives, money is the tool that people use today in the exchange of goods and services. When you reject money, you’re also rejecting receiving value for your work. In the long run, rejecting money makes it difficult for you to achieve your goals because you lack the monetary resources. The same goes for people who deny needing friends, family, love, contribution, health, rest, and so on. Ultimately, all areas on the wheel are important because they are parts of your life. Disregarding any one area may help you gain headway in other areas initially, but it’ll eventually it’ll put your life on hold. Because by disregarding an area, you disregard a part of yourself and hence your life. I’ve discussed this in detail in the previous post Are You Putting Any Parts of Your Life On Hold?, so if you haven’t read it, do check it out. With self-image, I realized that self-image is something that many people lack and that many sorely neglect today. Do you respect yourself? Do you love yourself? Do you believe in your capabilities? Do you value what you do? You are the one person who will be with yourself the entire life. If you don’t have a healthy self-image, then who’s going to respect you or appreciate you? If you have a poor self-image, everything will suffer. If you have a strong, healthy self-image, it’ll provide the foundation to excel in life. 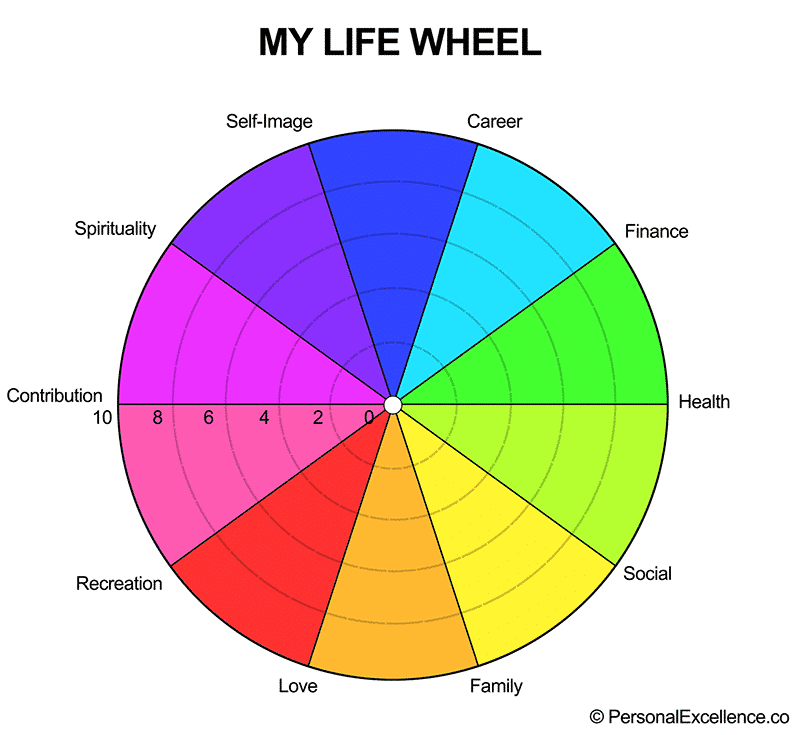 Life Wheel Exercise: How Are You Faring in Your Life? It’s exercise time! 😀 Let’s now assess how we’re doing in life. Get your pen and paper ready. Career – (This would be ‘Studies’ if you’re studying or ‘Business’ if you’re an entrepreneur.) How are you performing in this area? Are you achieving your best results? Are you growing and developing yourself to the highest level? Finance – How much is your income/monthly cash flow? How much do you save from there? Are you financially abundant Do you have enough money to pursue your goals? Health – How healthy are you? Is your life style healthy? Do you have enough sleep/rest? Are you eating healthily? Are you exercising regularly? Social – Do you have a good social circle? Friends to hang out with, talk to, confide in, have fun with? Do you have deep connections with these friends? Are you meeting new people? Family – How are your relationships with your family members? Your relatives? Do you talk with them freely? Do you communicate with them openly? Love – How much love do you feel in your life now? Love here refers to universal love, and not necessarily romantic love. It’s possible for someone who is single to rate this area highly, just as it is possible that someone is attached and rate this area lowly. Recreation – How much rest are you having? Are you pursuing your other interests and hobbies? Contribution – Are you giving back to the society and the world? Spiritual – How in tuned are you with the universe/your higher self? Self-image – Do you respect yourself? Do you love yourself? Do you believe in your abilities? Do you value what you do? Do you appreciate yourself? Describe why you gave that score to each segment. Draw your life wheel like the one below. 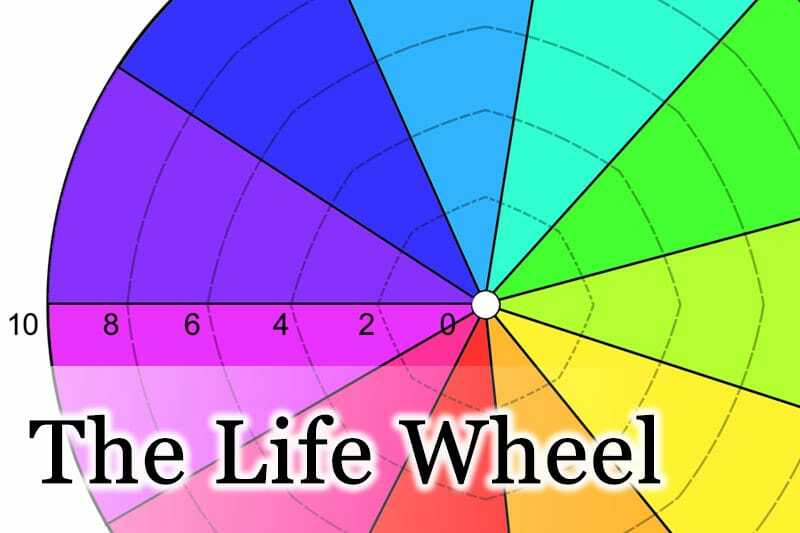 Mark the scores for each segment on the life wheel diagram. Connect them. You should have a continuous line, like a web, that links across each segment and finally loops back to the original point. Now that you have your life wheel drawn, it’s time to do some reflection. What is the shape of your wheel? How does it look? The bigger the web, the better you’re doing. There are 4 general shapes that each represents how you’re doing. Why does your wheel look like this? (List 3 biggest reasons) Whatever your life wheel looks like, it’s not a coincidence. If you had done this assessment a month or two ago, you’d end up with a similar shape. The bigger question is: Why? Read the analysis for your wheel shape above, then reflect that to your situation. What are the 3 biggest reasons why your wheel looks like this? Which are your lowest scoring areas and why? All 10 segments are equally important in living your best life. Some people may think they can just ignore 3-4 segments and score a 0-1 there – but it doesn’t work that way. Whenever there’s a part of your life that is blocked (or put on hold), a part of you is blocked too. Which segments have the lowest scores? Have you been putting off? Why? Are you happy with your wheel? What if you have to stick with these scores forever? How would you feel? Is this what you want? The first step toward getting somewhere is to first decide that you don’t want to stay where you are. The bigger your level of dissatisfaction, the better. What are your biggest priorities moving forward to achieve your ideal 10/10 wheel? What are your biggest actions that will help you achieve your goals? Set your goals as you move forward. Spend as much time as you need to reflect on your current status. Don’t rush this process. The more you reflect and understand how you came to be where you are, the better you can address it moving forward. This reflects you’re facing a lot of limitations – which are more self-limitations than anything. If you don’t do anything about this, you’ll keep drifting until your life eventually caves in. This is also the day when people suddenly wake up and realize they hate their life. But I’m sure you don’t want to wait for that day to come. If you have a constricted web, your immediate step should be to select your priority areas and take action on them. That’s great – you’ve made good headway in some areas. However, you’ve neglected other areas in the process. As we’ve learned, all 10 areas are essential to living your best life. Neglecting any of them only limits your life experience in the long run. First, mark out the 3-4 areas in which you’re severely underperforming in. Understand why that’s the case. What can you do to bring them back up? Next, identify how you are going to maximize them asyou continue to do well in the high scoring areas. We don’t want to neglect the high scoring areas just to bring low scoring areas up – That will just be switching from one problem to the next! The long-term, sustainable solution is to form a plan where you can maximize all areas together. This means you’re doing very well! Congratulations!! At the same time, there’s always room to maximize your life. How can you bring it a notch further and max out all your scores to a full circle? The ideal life. I see full 10 scores as an ideal to work toward, not a final state. That’s because there is always room to be better. Whenever we get to a 10, we can always find new ways to make it better. This is the beauty of life – there are no limits! What 10 means to us now will be different in a different time. We are the ones who define our limits. One common misconception people have with the life wheel scores is that low scores represent unhappiness. This can’t be further from the truth. The gaps between our scores and full 10/10s reflect opportunities to grow, not unhappiness. If someone has 9s and 10s, the person is either (i) doing supremely well or (ii) unaware of the possibilities in his/her life – usually the latter than the former, simply because there is infinite potential for betterment in life. A possible trap someone with 9s/10s will face is a perpetual state of non-growth (because he/she is very contented with the present state). How do we address this then? A simple method is to multiply what you have in your life now (achievements, wealth, productivity, fitness level, quality of your relationships, etc) by a factor of 5 or 10 and ask yourself whether you prefer the magnified scenario or your current one. If you reply the former, you got your answer. Does it mean that it’s impossible to get full 9s/10s then? Not quite. The 10s represent our highest vision of where we want to be – from our current state. As long as we constantly breaking new grounds and grow, we can perpetually remain in the 9s/10s. This is also known as being in the state of flow.